As you maybe know, I'm a fan of Pharmacist's Iron Gall ink, so when I saw he was experimenting with non blue-black i-g ink, I was hooked. The wait seemed long, but two weeks ago Pharmacist announced that tha ink was ready, and last week I received a parcel from Belgium. Inside, three bottles of ink : Terra Incinerata (green -> dark green), this Oriens-Occidens (orange -> brown) and the standard Document ink (blue -> blue-black). 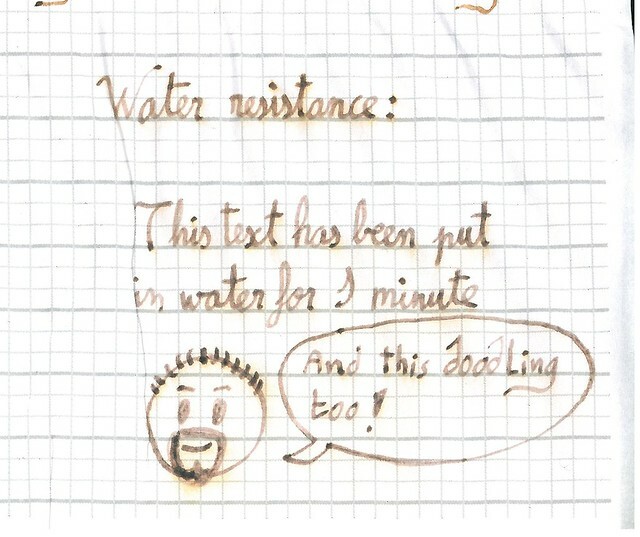 Water resistance : it's an iron gall ink, so it resist water! The bottom of the review has been submerged in water for 1 minute. Orange dye has completely disappeared, but the brown iron-gall is fully visible, and readable! 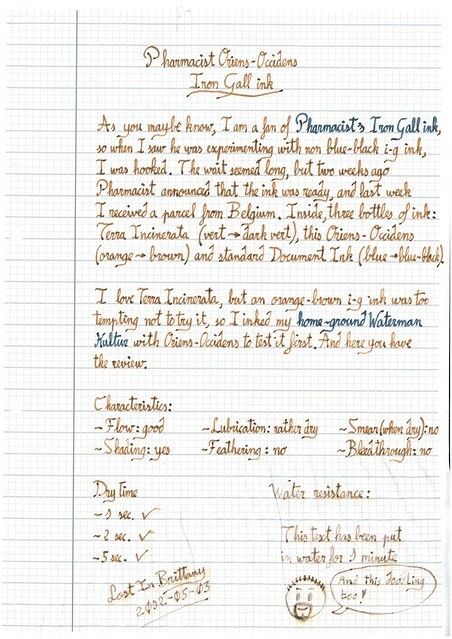 A wonderful ink, with all the properties I like in iron gall inks, but in a new and nice color. Great work, Pharmacist! Pharmacist is a member of Fountain Pen Network, the biggest (and best) fountain pen forum in the net. 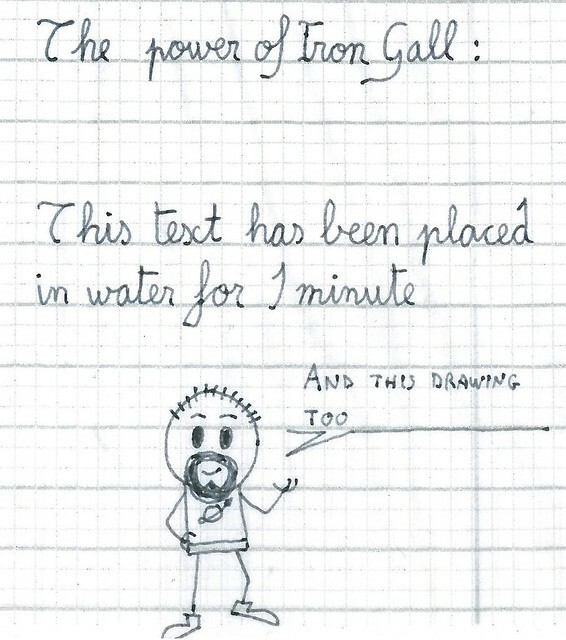 And he makes his own ink, a wonderful old style iron gall ink. Two weeks ago, I received a parcel from Belgium. Inside, two bottles of Pharmacist's iron gall ink. Since then, I've been using it as my main daily ink in my Parker Frontier. 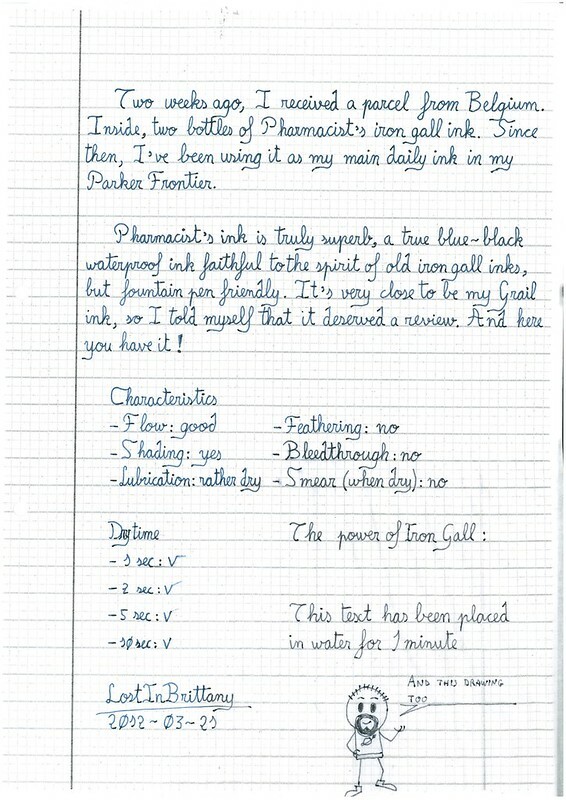 Pharmacist's ink is truly superb, a true blue-blac waterproof ink faithful to the spirit of old iron gall inks, but fountain pen friendly. It's very close to be my Grail ink, so I told myself it deserved a review. And here you have it !